What a snob. A reading snob. A snob of literature. And a snob worse than a social snob. Proust would be tickled – this woman would make a great character, I think. Before I move into “how dare she” mode (I mean Hillary Kelly), let’s just thank Oprah for bringing books to a lot of people – we can pass on the issue of whether they are “deserving of literature” or not. Thank you, Dennis, for these ongoing readings, am appreciating this extended time to soak in the richness of this experience, and realize the process continues. I particularly noted de Botton’s comment on what books might do for readers, “namely bring back to life, from the deadness caused by habit and inattention, valuable yet neglected aspects of experience.” This 13 months of reading brings back deep reading encouraged by good company. Every reading of Proust suffers from anachronism and displacement, we are not Proust, we read through different layers of time from a different position about a place and time that is outside our experience. Thinking of Virginia Woolf’s reading of Proust, how different her reading in 1922 would be than ours, the whole work not yet published, she is reading a contemporary author who draws on time nearly parallel to her own (she is 11 years younger than Proust). 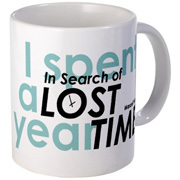 This reminded me of Woolf’s famous remark written in 1924, “On or about December 1910, human character changed. I am not saying that one went out, as one might into a garden, and there saw that a rose had flowered, or that a hen had laid an egg. The change was not sudden and definite like that. But a change there was, nevertheless; and, since one must be arbitrary, let us date it about the year 1910.” Peter Stansky wrote about the emergence of Bloomsbury using this remark as the foundation and title of his book On or About December 1910 which I was browsing thinking of Virginia Woolf gestating her material as did Proust at this same time, (think of Virginia’s mother Julia, of the boat out to the lighthouse, of Proust’s mother, of the steeples of Combray…) Stansky concludes his look at 1910 and Bloomsbury with Roger Fry’s extraordinary and then-shocking exhibition of Post-Impressionist paintings noting the names of those luminaries supporting the exhibit some of whom were honorary names on the masthead – and among them Comte Robert de Montesquiou-Fezensac, “the famous French Dandy and model for Proust.” Doesn’t that just bowl you over? In Bookforum’s end of year notes, this from Anne Carson: “This was the year I finished Proust!! Decided to read it in French, started in winter 2003, read it every morning with breakfast until last May, when I closed the final volume. Withdrawal is harsh, but those pages are worth it.” I just bought an old Modern Library Moncrieff set, 1932, the two big 1000 page volumes feel so different from the stack of 6 paperbacks I just read. I look forward to reading in it, as marchhare suggests, a few minutes, a few pages. This edition has an introduction by Joseph Wood Krutch, whom I most associate with desert natural history but who is in the great generation of humanists, a man of letters. His is a fine and satisfying introduction to read at last, discerning and wise, suggesting a reader who has read and reread Remembrance of Things Past with a deep respect. 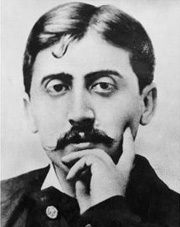 Krutch’s most anthologized quotation, “Happiness is itself a kind of gratitude,” expresses my feeling toward Proust. May I just throw in, as we have delighted in Proust, we will relish Dostoevsky, we would find Dickens marvelous. Oprah’s community of readers will be happy and grateful to read Dickens again or for the first time. The New Republic essay is pitiful is its presumption that readers might not be up to 19th century prose, impoverished in its low expectations, rude in its restriction about who might read Dickens and with what guidance as if Great Expectations required a classroom. And how, exactly, is Oprah not adequate to the task of reading deeply, of cheering on her readers? Hillary seems particularly unhappy about an accompanying beverage, reading Dickens with that hot cup of chocolate. It’s a really repellent article. As you say, the more you think about it, the more it rankles. lxp is just dead-on here. Kelly’s condescension rankles but it’s not unusual in the literary world. In this era of change, the literary establishment often lashes out at the newcomers in an effort to shore up its crumbling authority. Oprah is an easy target. One good word from her about a book, and millions will rush to buy it. At the end of the day, people like Kelly are just jealous that their opinions don’t have the same effect as a few words from Oprah. What good are the literary establishment’s PhDs and MFAs when someone who has never read Dickens has more effect on the literary market every single day then they will have in an entire lifetime? There are other examples of this kind of defensiveness. Bloggers who write book reviews are looked down upon as unqualified and irresponsible. People who self-publish their books are characterized as vain and self-important. It’s sour grapes, I think. Kudos to Oprah for accomplishing what many have never been able to do: getting people excited about reading the classics. It really goes without saying that reading creates readers. I read _David Copperfield_ as a child, in a non-reading household with no one to help me and that is what truly turned me into a reader. Up to that point in time I read just anything, Dr. Seuss, the dictionary, cereal boxes, comic books, nature texts…just anything. But reading Dickens, all alone, not knowing what everything meant, made me a lover of reading and of books. This has outlasted and will outlast everything else that I do. So, bunk on this lit crit person.